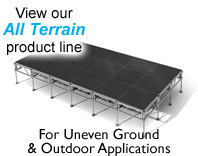 Staging 101 Basic Stage System - 96SQ FT 12 ft x 8 ft stage system (3pcs. of 4'x8' platforms). Available in Carpet or Industrial finish. 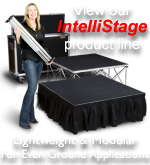 Staging 101 Basic Stage System - 192SQ FT 12 ft x 16 ft stage system (6pcs. of 4'x8' platforms). Available in Carpet or Industrial finish. 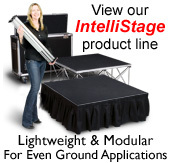 Staging 101 Basic Stage System - 288SQ FT 12 ft x 24 ft stage system (9pcs. of 4'x8' platforms). Available in Carpet or Industrial finish.